Today, MSI Integrity and the Duke Human Rights Center at the Kenan Institute for Ethics published a summary report on our new database of standard-setting multi-stakeholder initiatives (MSIs). In the report, The New Regulators? Assessing the Landscape of Multi-Stakeholder Initiatives, we analyze 45 MSIs that set voluntary standards for business and government conduct on a range of human rights and environmental issues. The report and database are intended as introductory resources on MSIs for MSI participants, civil society organizations, community groups, companies, researchers, and the general public. With a few exceptions, most MSIs are not household names. Nevertheless, they have profound global reach. MSIs operate in over 170 countries on six continents, and set standards for over 9,000 companies with combined annual revenues of over $5.4 trillion. Moreover, MSIs are ambitious: they have been created to address some of the most intractable problems linked to the global economic system, ranging from child labor to deforestation and online privacy. But while MSIs have gained prominence as a new category of regulatory institution, our preliminary findings suggest that many MSIs lack one or more of the basic institutional elements necessary to effectively set and enforce their own standards. This raises serious questions about whether MSIs are collectively up to the task of addressing the challenges they face. As MSIs have only come into existence during the past few decades, the structure and impact of these “new regulators” remain poorly understood. We begin by looking at the growth and industry spread of these MSIs, finding that most were formed in the late-1990s and 2000s, with only a handful of new standard-setting MSIs launched since 2011. 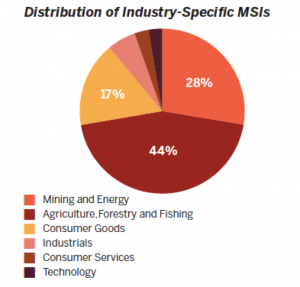 Most of these MSIs focus on setting standards for specific industries, with over 90% clustered in three sectors of the economy (consumer goods; agriculture, forestry, and fishing; and mining and energy). 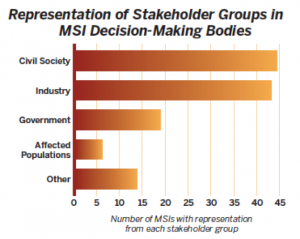 Next, we assess how MSIs are governed and the extent to which they include different stakeholder groups. Our analysis reveals the troubling finding that most standard-setting MSIs fail to meaningfully engage the workers and communities that are most affected by MSI standards: Only 14% of the MSIs include affected populations in their main governing bodies, while only 49% of MSIs involve affected populations at all. Lastly, we examine whether MSIs have the basic operational structures needed to set and enforce standards of conduct for their corporate and government members. These include systems to monitor members for compliance with standards, sanctioning mechanisms to address non-compliance, and complaints mechanisms to enable individuals or communities to report environmental or human rights abuses that violate initiative standards. Distressingly, 20% of initiatives lack any power to sanction non-compliant members, and 60% do not have an external complaints or grievance mechanism. Because the MSI Database includes only limited information about each MSI and its institutional design, the report analyzes MSIs as they exist on paper, rather than as they operate in practice, so our findings are necessarily preliminary. For example, the database and report look at whether an MSI has a complaints mechanism, but not at whether the mechanism is well-designed, accessible, effective, or even implemented. Nevertheless, the report raises serious questions about what role MSIs serve if many of them lack the basic institutional elements necessary to be effective. We hope that the report and database contribute to discussion and future research on the role of MSIs in addressing critical human rights, environmental, and governance challenges. We also look forward to feedback, suggestions, and other perspectives on the database and report findings and encourage interested stakeholders to contact us at info@msi-integrity.org.